Tonight there was a sneak preview of Portland’s new tiki bar thatch, an art installation party for two velvet paintings by Portland’s Pander Bros. Another sneak peek is planned tomorrow, for Tiki Central members only. 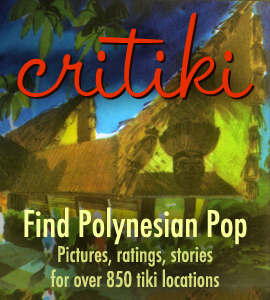 Heather Gregg and Noel Henneman both uploaded photos to Critiki (psst — Critiki is always looking for more photos of tiki places!). Owner Robert Volz hired Portland’s Bamboo Craftsman to do the bamboo construction, and it looks absolutely gorgeous in these pictures. The bamboo and decor even extends into the restrooms. The water features near the entrance do a great job of letting visitors know they’re heading into a different world when they come off the street (it’s great to see the use of clam shells). My one little quibble is that the pufferfish and tapa lamps, which are gorgeous, are lined up a little too neatly for my taste — I prefer a look that gives the impression of items added over time, one where there’s a sense of discovery as you see things you hadn’t seen before. That may be Robert’s way of marrying the midcentury modern booths and seating to the inherently flotsam & jetsam-driven world of tiki. It sounds like there’s more work to be done before they open though, so maybe more stuff is going up on the ceiling. Overall, the place looks really inviting. There’s still no final word on what date Thatch will be open to the public (Saturday is not looking likely, but the opening is definitely imminent). Visit Critiki to see the all the pictures, and thanks to Heather and Noel for sharing them so quickly! UPDATE: Thatch will be open for regular business starting next Wednesday, January 10.